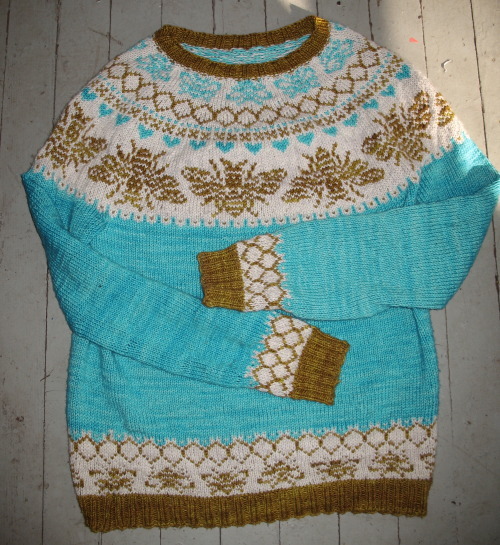 Craftster Community > KNITTING > Knitting: Completed Projects > bee sweater!! i named this sweater "the dream sweater" because it is made with very soft cashmere/merino blends and i've been conceptualizing it in my head for months. i used this sweater generator: http://prjonamunstur.is/#/Design i got the charts from this awesome baby sweater, which is my ultimate inspiration: http://www.ravelry.com/patterns/library/the-bees-knees when i saw it i immediately started visualizing gold bees on an adult-sized sweater. and here's the sweater on its own! it took me about three weeks and i just got finished! it came at a perfect time because it just snowed a ton in georgia. I love the circular shape on the shoulders and the handmade look. Wow, extremely impressive! 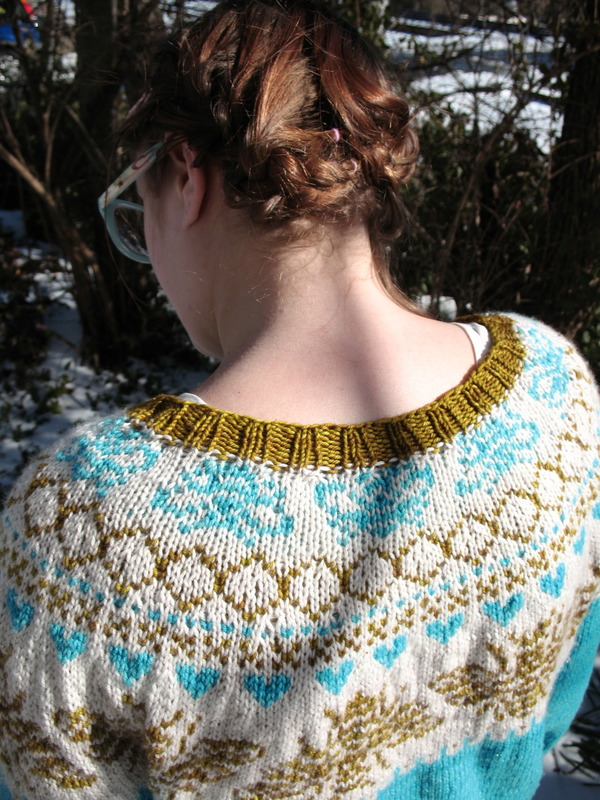 What a great motif for a sweater, it's gorgeous! Wow, it turned out great! You did a great job designing that pattern. And it looks adorable on you. If I had a little grandchild, I would need that baby sweater. You could knit it for me. Just sayin'. This is Awesome!!! Great job! I love the bees. It's awesome!!! The color and design both are totally lovely!! Also, I love your shoes with that outfit. Absolutely gorgeous! I love the pattern....you have knitting super powers. I said that with the last awesome sweater you posted. It's bee-u-tiful! Wonderful colours, looks wonderfully cozy.